Sustainable development is a pattern of resource use that aims to meet human needs while preserving the environment so that these needs can be met not only in the present, but also for generations to come. Sustainable architecture attempts to reduce the collective environmental impacts during the production of building components, during the construction process, as well as during the use life cycle of the building. 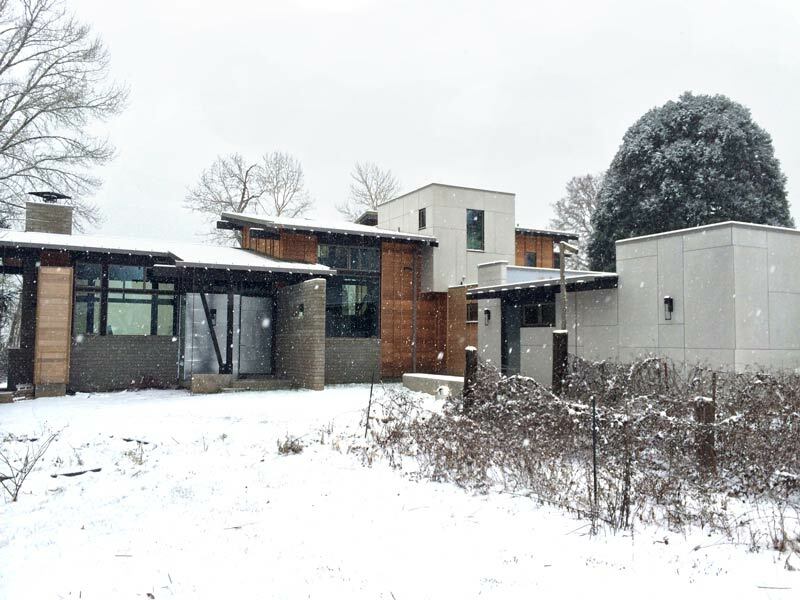 From the beginning Ewing Architects has been intrinsically involved with Sustainable practices in our methodology. All aspects of any Ewing master plan involves the sensitivity of siting structures to minimize grading, to preserve natural features and trees, and enhance the natural aesthetics of the site. Respecting site specifics usually results in cost savings during construction. Taking advantage of correct structure orientation like the north – east – south – west sunlight and shade channels will result in desirable indoor-outdoor transitional spaces that are usable and comfortable at any time of day or season. A unique sustainable practice utilized by this office is efficient project programming to guide the design phase. Well thought out use programs result in less square footage of floor plans and less cubic footage of interior spaces which minimizes the use of building materials and energy resources resulting in less costs. Being good stewards of our environment also involves other aspects of design including the use of renewable and reclaimed materials, FSC (certified woods), local manufacturers and manufacturers that employ green practices. Our landscaping strategies involve designing with drought resistant planting (xeriscaping), using local growers and bio-diversity. This is what we refer to as natural sustainable design – sensible thought processes using age-old common sense to create unique habitable environments and structures. These natural sustainable design techniques tend to be effective and affordable. The design of roof lines, structure projections and shading devices further enhance the natural cooling and warming of these structures. This sustainable design technique will create energy and cost savings in any climate or region. Day lighting is a major consideration of each Ewing design. We believe every room in a structure should be open to exterior sunlight and views decreasing the dependence on electrical lighting and mechanical ventilation. Another essential element of our Sustainable design methodology is indoor environmental quality including air quality, lighting, thermal conditions and acoustics. We can also extend these practices into the current sustainable technologies such as solar, wind, hydro, bio-energy and geothermal sciences. These technologies tend to add costs to projects that some clients may not want to do. Many projects today require LEED Certification, which this office can provide if required. Developing sustainable projects and structures is the responsibility of the architect and the client working together for the benefit of all. There was no grading on this project. Without removing trees, the building was sited in a natural swale in a pine tree grove. The design was a dual personality – heavy and fortress like with indigenous moss rock splayed walls found on site and small windows on the north side to shed the snow build up, and major full height glass windows extending onto verandas for solar gain, natural day lighting and views on the south side. 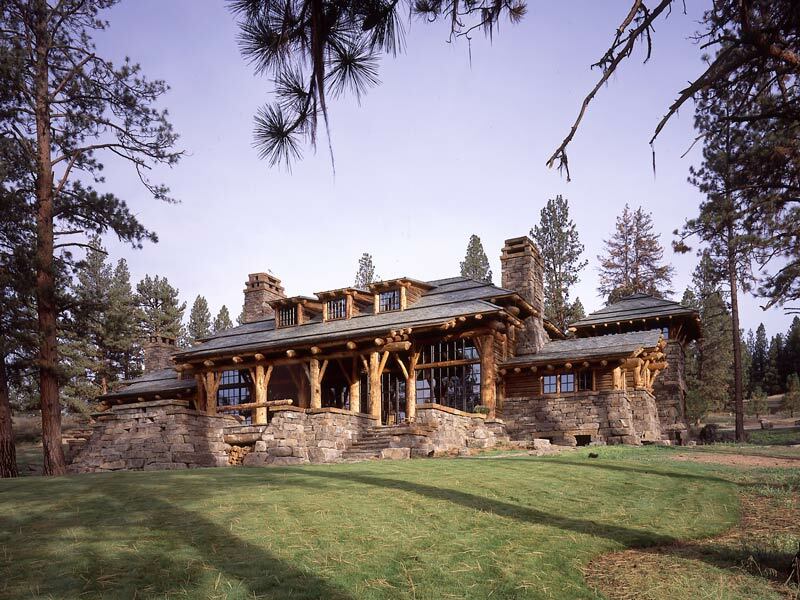 The lodge is constructed with “fire killed” logs of reclaimed lodge pole pine from the 1988 Yellowstone fires and more recent Montana fries on the ranch itself. 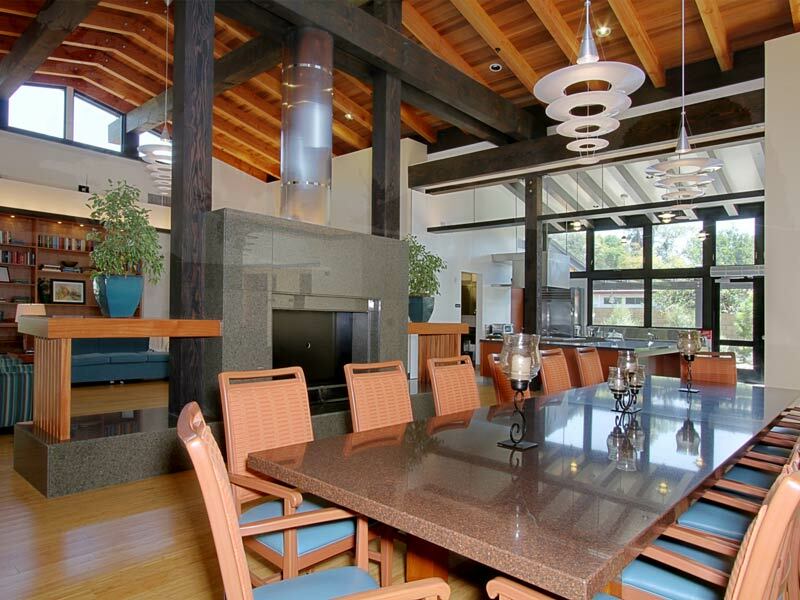 Four fireplaces provide the heat using beetle killed trees from the ranch for fuel and natural cooling is provided by large overhangs, window venting, proper orientation and heavy tree canopy cover. The Evergreen Villas Green House is the first Skilled Nursing Prototype of its type fro the State of California. The project was designed using sustainable materials, products and procedures and is applying from LEED Silver Certification. The concept of the prototype skilled nursing facility is a warm inviting home and garden environment as opposed to the cold sterile institutional stereotype facility. The house is an open plan Great Room concept with large windows providing natural light and opening to private garden patios. It is home to 10 residents. The spacious and accessible kitchen invites elders to participate in meal preparation. A Den provides a place for small private Family Gatherings overnight visitors. 2013 AIA Award. LEED Silver Certified.